Life can be complicated but taking care of your garden needn’t be. Leading lawn tractor manufacturer, Murray, acknowledges this and therefore prides itself on its “Get it done. Go have fun” ethos to tackling lawns. There are six models in the Murray line up, all packed with features to give a high-quality cut in no time at all. The range is split into three lawn tractors, and three zero-turn models. Within the lawn tractors there are two side discharge models with a side deflector that disperses the cut grass evenly around the lawn. These offer differing widths depending upon the garden size; for small to medium lawn, there is the MSD100 with a 42” cutting width, alternatively the MSD200 WITH a 46” width is more suited for larger areas. Both models have a Briggs & Stratton Intek™ series engine with 11 litre fuel capacity, as well as seven stages of height of cut adjustment. The MSD200 has a wide range of cut heights from 3.8cm to 10.2cm, against the MSD100’s 4.5cm to 8.5cm. Another feature of the MSD200 is that it has cruise control for effortless mowing. The third lawn tractor is the MRD200 which is the only Murray model to have direct collection, tow hitch and 350 litre grass collector. This has the smallest cutting width in the range at 38”. All three lawn tractors have hydrostatic drive, boast a 36cm turning circle with 15” x 6” tyres and come as standard with a mulch plug. Alternatively, for further reduced mowing time through enhanced manoeuvrability, Murray has three zero turn models available. These operate using two handles on each side of the machine; each with a push/pull function for forwards and reverse movement. Each handle is linked with two individual rear wheels, each with its own independent motor, which allows the tractor to turn within its own footprint. This allows for excellent manoeuvrability when cutting around trees, flower beds and other obstacles, with the added bonus of removing the need for backing up at the end of each mowing pass – simply spin 180° and go back! The entry level machine is the ZTX110 with a 42” width, and seven different cutting heights. The mid-range model is the ZTX150 which has three blades, offers a 46” cutting width and 13 cut of height positions. 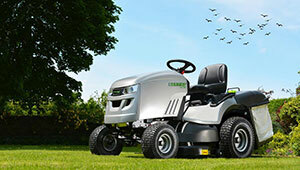 The premium model in the Murray range is best suited for professional users or those with lots of grass to cut. The ZTX250 utilises a Briggs & Stratton Professional Series™ 8270 V-Twin OHV engine and has an incredibly wide deck of 48” to reduce the total amount of cutting passes required, and subsequently saves the user time. Affordable and efficient, Murray products have been getting the job done for over 90 years. Today, as a member of the Briggs & Stratton family of outdoor power products, Murray products are exclusively powered by the world’s leading small engines from Briggs & Stratton, delivering reliable, high-value products to simplify busy lifestyles. All Murray products have a two year domestic warranty. Murray lawn and garden products are available in the UK exclusively through Henton and Chattell dealers. For more information please visit www.murray-tractors.co.uk.